If you mention the word barbecue to anyone in the UK, they’ll immediately think of burgers and sausages being incinerated to within an inch of their life over a bed of hot charcoal. Barbecues aren’t something we tend to take awfully seriously over here. They’re often just an excuse to celebrate the arrival of a rare bit of sunshine by sitting outside, batting away the wasps, whilst you eat badly charred food along with a beer or a glass of wine. Other countries take their barbecues way more seriously. We have a friend who lives in North Carolina; the barbecues she knows are rather different to the ones we have on this side of the Atlantic. No puny burgers or sausages there – they cook real meat. Giant shoulders of pork, barons of beef, whole chickens. No half measures there. The weather this summer has been unusually hot and sunny, so the barbecue was dusted off and burgers and sausages duly cooked. It was all very nice, but I felt we were missing something. Couldn’t I do something different? A bit more adventurous? My wife had bought me a book a while back: John Willingham’s World Champion Bar-B-Q. I’d not really used it very much, but I picked it up again and starting flicking idly through. Now, here was a guy who definitely took his barbecues seriously. I realised I wanted to make this stuff. So, this summer, I resolved to make better use of the barbecue. Not just burgers, I would cook vast hunks of meat. Beef, pork, chicken, lamb. Everything. 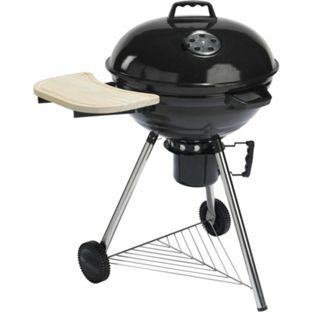 Our barbecue isn’t a particularly flashy model. It was an inexpensive one from Homebase, bought about four or five years ago. It’s a bit rusty and shaky on its pins these days, but then we’ve kept it outside in all weathers. All in all, it has served us well, and proved excellent value for money. This might well be its last summer, so I figured it could at least go out in a blaze of glory. I’m not sure it would hold a whole baron of beef, but I could still fit a decent size joint of meat in there. The first recipe to really catch my eye in Willingham’s book was the “World Champion Brisket”. I love beef and would never have thought of cooking brisket on a barbecue. This I had to try! I also knew I had a piece of brisket in the freezer, so that clinched it. Out it came. The recipe called for a 6 – 9 pound brisket – mine was rather smaller than that, but still plenty big enough for the two of us. The brisket started off being marinated in a mix of orange juice, vinegar, sugar, pepper and chilli overnight. The next day, I lit the barbecue. Now, this is the important bit. You don’t cook the meat over the coals. Doing that would just cause the bottom to burn before the centre has cooked. Instead, you need to heap up all the coals over on one side of the barbecue, and place the meat over to the other side. That way, it’s away from the main heat source and is much less likely to burn. According to the book, the brisket is cooked when it reaches 185˚F internally – that’s 85˚C to us. So, I inserted my meat thermometer, put on the lid, and waited. I expected this would take quite some time to cook, but the meat reached 85˚C surprisingly quickly. I peeked under the lid – it certainly looked cooked. I left it a little longer just to be sure, whilst I got on with the rest of the meal. After about 90 minutes or so, I took it out, ready to serve. And it turned out to be really rather delicious. Served with garlic buttered mushrooms, home-made cole-slaw, salad and a barbecue sauce from the Willingham book (“Big Bubba’s Bar-B-Q Sauce”). The beef looks rather puny in the photo above, I’m sure that’s just a trick of the light. It fed us for a good couple of meals. Definitely one I’ll do again. Spurred on by the success of the brisket, pork just had to be next. 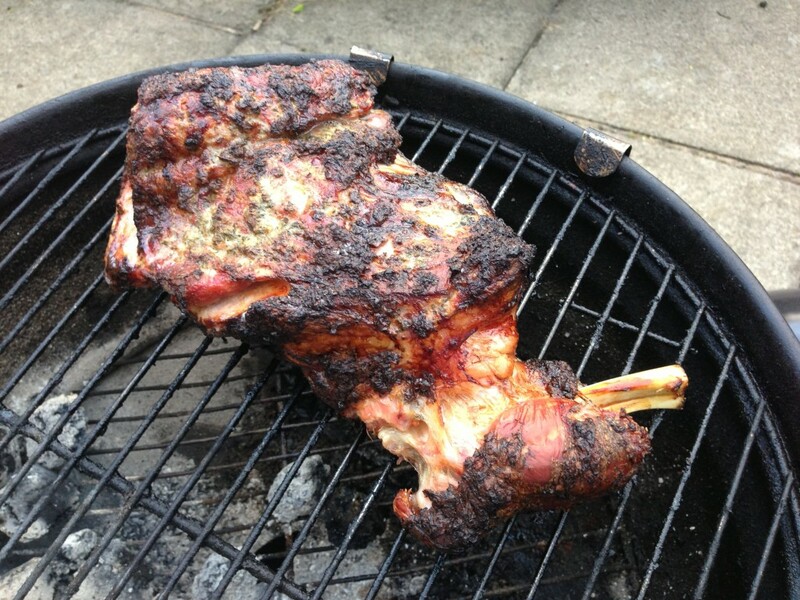 I added a large pork shoulder to my next Ocado order, and started reading up about pulled pork. To prepare the pork, you first need to remove the skin and thick layer of fat that lies beneath it. (I was loathe to waste this, so I cut it into small pieces and fried it into pork scratchings the next day. Delicious.) Next, rub the pork with a spice mix and leave to stand for an hour or two. Normally, I’d use my own spice blend for something like this, but our friend from North Carolina had very kindly brought us some locally made spice blends the last time she came to visit. It seemed appropriate to use one of these, so I did. From then on, the process is pretty much the same as with the beef. Stack the coals on one side, place the meat on the other. Cover, and wait. 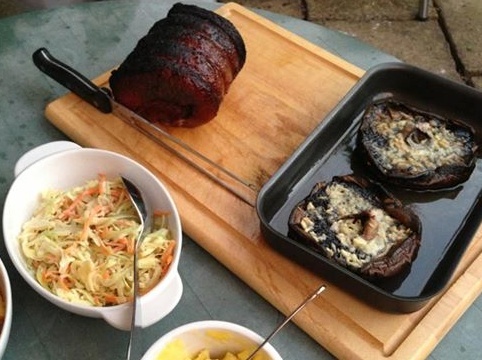 Once the pork reached 85˚C, I took it out and left it to stand a little whilst I grilled some aubergine slices to go with it. 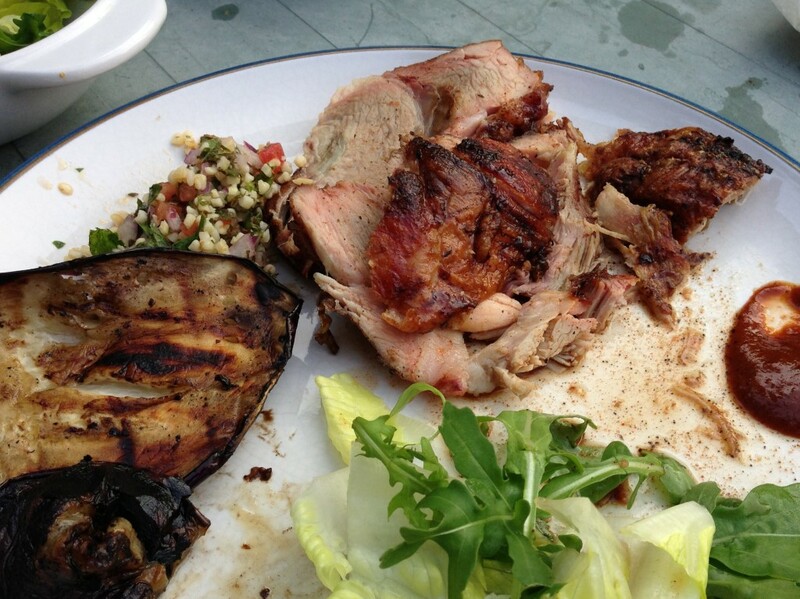 I sliced it and served with the aubergine and some tabbouleh. Again, it was delicious. My only slight criticism of the pork is that it wasn’t quite as tender as I would have liked. I think I was too eager to pull it out of the barbecue once the thermometer said it was ready. I’m going to make this one again soon, and this time I will give it extra time in there. The left-over pork, I shredded and froze. It’s been providing me with some nice lunchtime snacks. Heat up a portion in the microwave, then serve between a couple of slices of home-made sourdough together with a some chopped red onion and a dollop of mayonnaise. Yum! It continued. The following weekend, I moved onto poultry. A whole chicken, again rubbed with spices, and cooked for about two hours. Last weekend it was the turn of lamb. A whole shoulder, first marinated in yoghurt, garlic and mint, then cooked for around two and a quarter hours. The lamb was my favourite of all. Incredibly tasty, with a crisp outer shell and a succulent, tender interior. That one was a great hit. Last night, I took some of the leftover lamb, and roughly chopped it. I cooked some finely chopped onion and garlic until soft, then added some home-grown peas, and stir-fried those until the peas were just cooked. 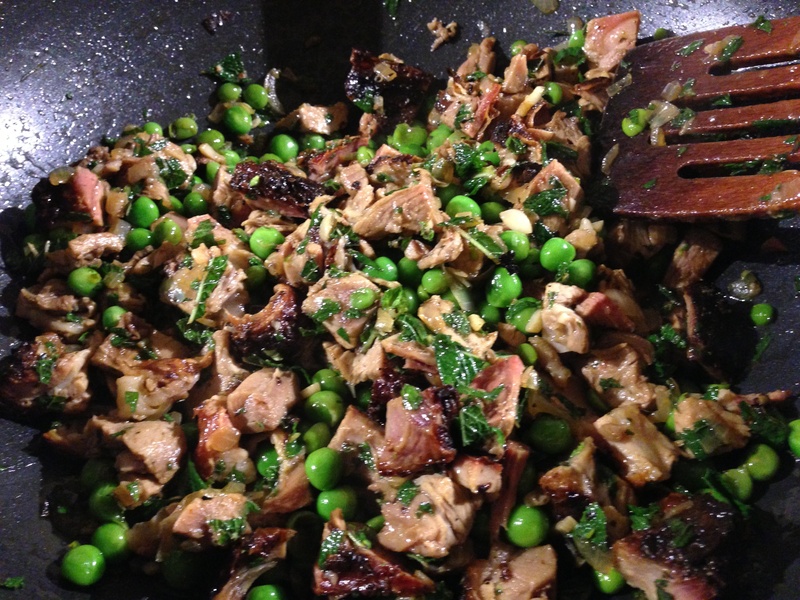 Finally added the lamb and a generous handful of chopped mint and stirred until the lamb was heated through. That was utterly delicious. Over the past few weeks, the barbecue has seen more use than the oven has, and I’ve become a firm fan of it. So much so that I’ve already caught myself looking at newer, better models. 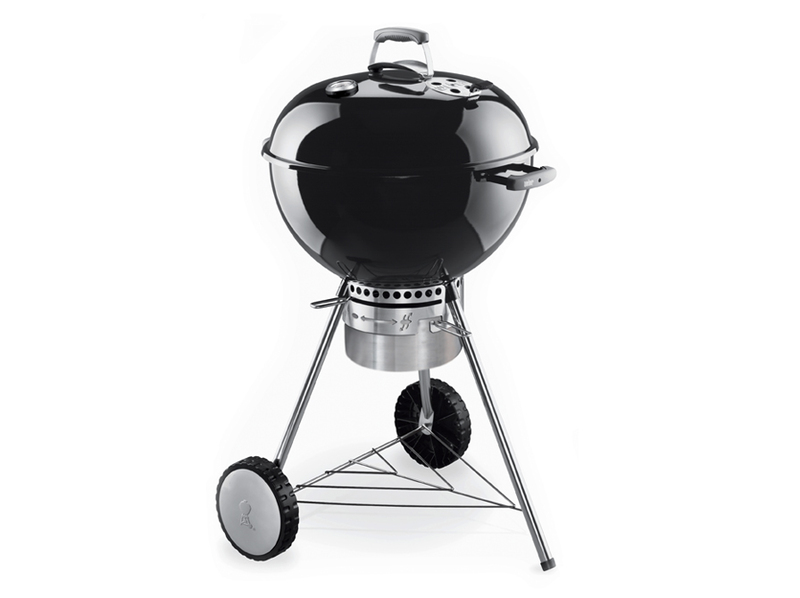 There’s one on the Weber web site I have my eye on now. Hmmm, now I am curious and keen to try it out. Not sure if my Co-op barbie is up to the job, though it does look like the genuine article. 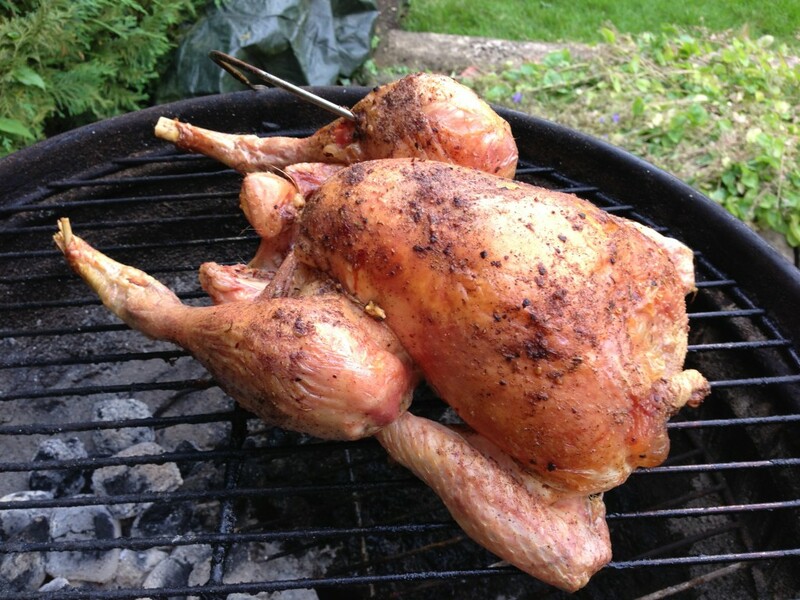 Do the coals really stay hot long enough to cook a chicken for two hours? Once you put the lid on, yes, the coals stayed hot plenty long enough. When I did the first couple of joints (the brisket and the pork), I was fretting that I’d need to top up the coals. By the time I got to the chicken and lamb, I realised it was all just going to be fine. I imagine if you had a substantially larger joint, you might well need to top up the fuel a little, but for more modest sizes (and these really weren’t all that modest), then one load did just fine. When you say “one load”… how much of a bag does that equate to? and so “one load” equates to one of those full. That’s about enough charcoal to loosely cover the whole grill if they were spread out. It will also depend on the type of charcoal you use – some burns faster than others. You could always add more part way through, but I haven’t found that to be necessary yet.